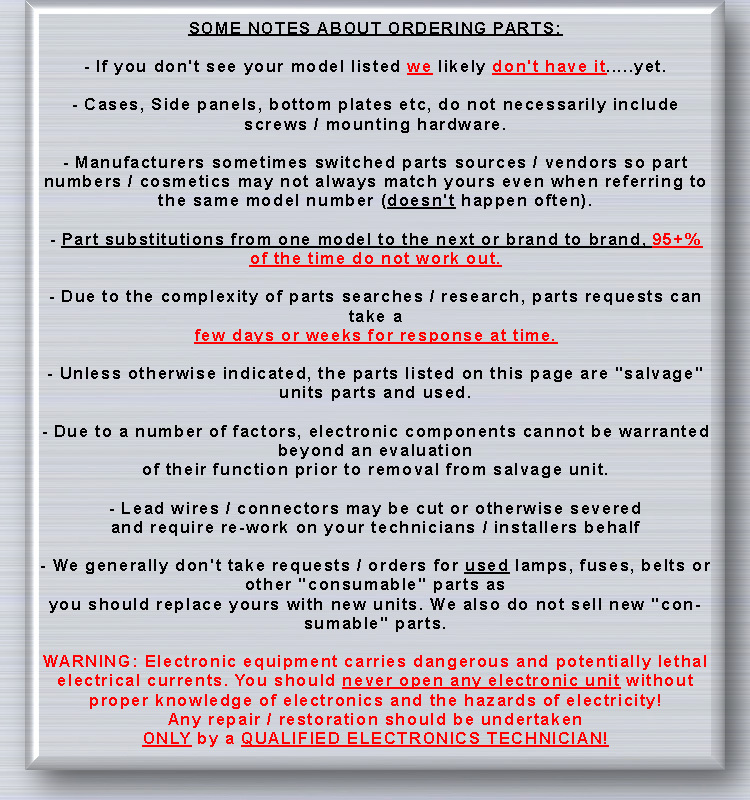 Stereo / Home Audio parts spares replacement electronic parts. 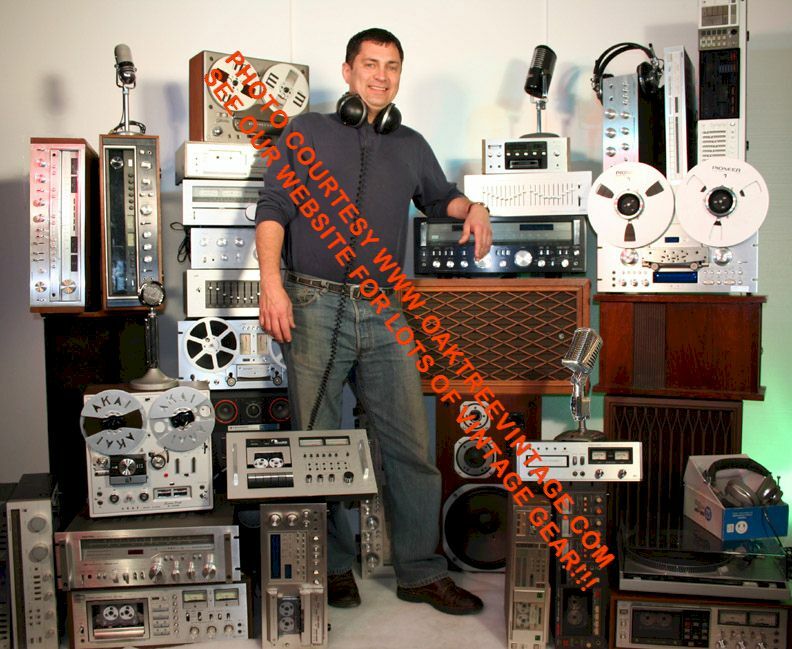 Replacement Parts for some Vintage receivers, cassette decks, amplifiers, stereo gear / equipment, amp amplifier parts cassette decks, tape recorders, tape players, turntables, record players, replacement parts / spares for reference and cross reference and occasionally for sale. 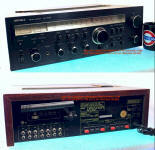 Spares / Parts for 'vintage' stereo units by brands such as MILLER & KREISEL / M&K, MCS, NAD, OPTONICA / SHARP and others. More, Misc. parts units below. So, here's a package of parts we recently received from an Ebay seller. He advertised them as "some pins may be bent, but should be easy to straighten". Ok, but at least fasten them to a piece of cardboard, or something 'rigid' so they don't get any worse, instead of just putting them loose into an envelope. Parted out due to 'no stereo FM reception / stereo indicator function' (no, it wasn't just the bulb). All else tested well. On our test bench, the internal amplifiers of this receiver #...7491, produced 25.5Volts per channel @ 8 Ohms with 1KHz input for 81 Watts and 21 Volts per channel @ 4 Ohms with 1KHz input for 110 Watts via discrete, TO3, metal cased outputs. (2x 2SC1116 & 2x 2SA747) AC Idle current at .4A, & floor noise L=<40mVAC & R=<30mVAC (both prior to any sort of adjustment, which we didn't do any further work on, due to the "no stereo indicator" issue). 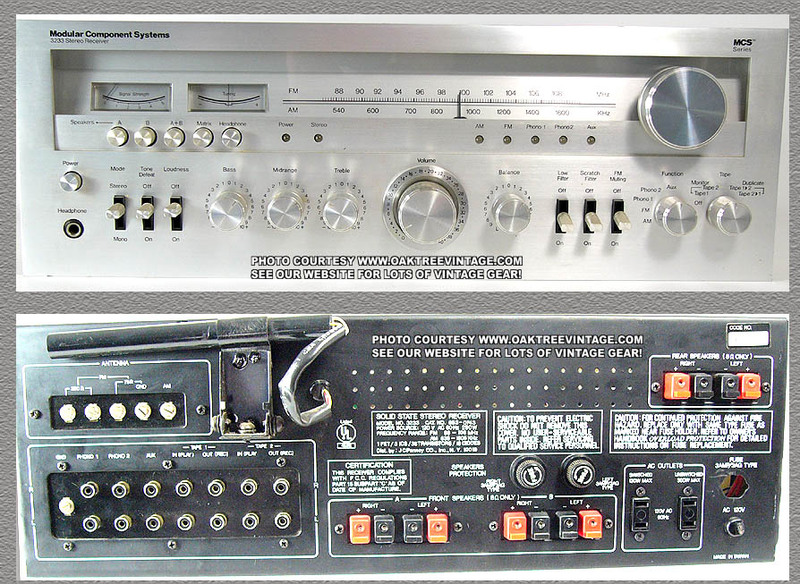 Panel, Face Panel w/ dial window, minor wear to plexi window, small �tics� / wear to bottom edge, and left edge, with a small scratches near below the 'speaker "C"' switch, of aluminum face, but overall decent condition. Would use on a restoration with an end rating of 8-8.5 - $55. Panel, silk screen dial display / 'Slide Rule'. Brushed aluminum - $35. Pointer / Indicator, Dial Pointer / Needle - $30. Diffusion Panel, Light Diffusion Plexiglas (bulbs / lamps not included) - $25. Sockets, Dial lamp / bulb plastic / twist sockets (lamps / bulbs not included) - $20. ea. Sockets, 'Stereo Indicator' lamp / bulb rubber socket (lamps / bulbs not included) - $20. Knobs / Caps / Buttons / Covers, 'Rectangular' 'Input Selector' knob / Paddle. Decent cond. Lower, right corner small 'ding'. - $35. Knobs / Caps / Buttons / Covers, Round �Tuning� Knob - $40. Knobs / Caps / Buttons / Covers, Round �Volume' or 'Balance� knob. Decent with minor scuffs. - $35. 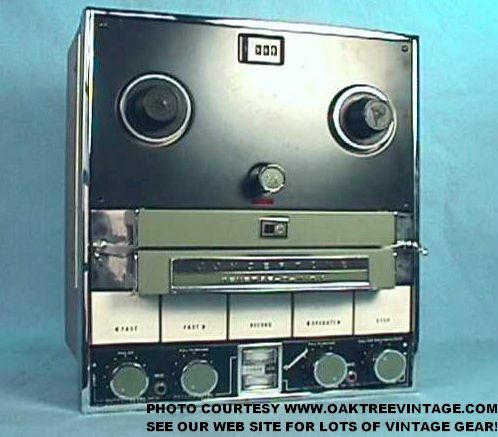 Knobs / Caps / Buttons / Covers, Rectangle 'Push Caps' for; �Power�, �Loudness�, �Tone Defeat�, �FM Muting�, �High Filter�, �Mono�, �Mon Tape1�, �Mon Tape 2� �Speaker Selector Switches A, B, or C. - $25. ea. Switches / Selectors, �Input Selector� rotary wafer switch, �FM�, �AM�, �Phono 1�, �Tape 1�, �Tape 2� - $55. Potentiometer / Controls, Noble stacked �Volume� pot - $55. ea. Potentiometer / Controls, Noble quadruple stacked �Treble Mid Treble� pot - $55. Potentiometer / Controls, Noble quadruple stacked �Bass / Mid Bass� pot - $55. Potentiometer / Controls, Noble double stacked 'Balance' pot 100k Ohms x 2 - $40. Capacitor, 7-Gang Tuning Capacitor ALPS FL526U12 / 7811 (string wheel sold separately) - $55. Tuning Wheel, Plastic / Nylon Tuning String Wheel / Pulley - $30. Meters, D'Arsonval / Analog 'Signal Strength' meter, #8B16 - $35. Meters, D'Arsonval / Analog 'Tuning' meter, #8B11 - $35. Transistors / Outputs, Output Transistors Sanyo 2SB697 Original Japanese TO-3, metal cased units. NOT Chinese knock-offs / counter-fits - $25. ea. Transistors / Outputs, Output Transistors Sanyo 2SD733 Original Japanese TO-3, metal cased units. NOT Chinese knock-offs / counter-fits - $25. ea. Heat Sink, Aluminum heat sink - $25. ea. Circuit Board, P-200533 / SEC 6710-9HB Circuit board w/ transistors; 2SA750, 2SC1222, and balance of capacitors, diodes, resistors, and transistors (control pots sold separately) - $55. Circuit Board, P-200534 Driver / Power Amplification Circuit Board with transistors 2SA1019, 2SB631, 2SC536, 2SC2362, 2SD600, and balance of capacitors, diodes, resistors, variable resistors, and transistors (output transistors and heat sinks sold separately) - $55. Circuit Board, P-200535 Driver / Power Amplification Circuit Board with transistors 2SA1019, 2SB631, 2SC536, 2SC2362, 2SD600, and balance of capacitors, diodes, resistors, variable resistors, and transistors (output transistors and heat sinks sold separately) - $55. Circuit Board, P-200509 / SEC 2142-94V 1 Circuit board w/ transistors; 2SC945, Hitachi L24, and balance of capacitors, diodes, resistors, and transistors - $25. Circuit Board, Circuit board P-200539 w/ resistors - $20. Circuit Board, P-200532 / SEC-6710-94HB Circuit board w/ transistors; 2SC1400, 2SA750 and balance of capacitors, diodes, resistors, and transistors - $25. Circuit Board, P200514 / SEC-6710 94VHB Main Tuner Board w/ IC chips; Sanyo LA1230, LA3350 transistors; 2SA844, 2SC535, 2SC536, 2SC929 and balance of capacitors, diodes, resistors, adjustable transformers and transistors - $45. Circuit Board, P200536 Protection / Power Supply Circuit Board w/ rectifier, diodes and transistors NECF7, 2SD571; and balance of capacitors, 50V 1000 uf capacitors, diodes, resistors, and transistors (NOT including relay) - $55. Rectifier, FULL wave bridge rectifier S5VB. Original Japanese. Not Chinese knockoff / counter-fit - $20. Relay, DEC Type MS4U / 24VDC - $25. Transformer, Power Supply Transformer #P-100509TKP0169-7 - $75. Jacks / Terminals / Connectors, �Main In�, �Pre Out�, �Tape Out Mon 1 (Out, In)�, Tape Out Mon 2 (Out, In)�, �Phono Mag�, (entire section as one assembly including fixed circuit board P-200576) - $50. Jacks / Terminals / Connectors, Speaker Outputs / Terminals A, B, C (barrier strip style) for (bank of 4) - $30. each bank. Jacks, �Headphone Jack 1� - $25. Jacks, �Headphone Jack 2� - $25. Jacks / Terminals / Connectors, Antenna connectors / barrier strip �FM�, �AM�, �Ground� (as one assembly) - $25. Jacks / Connecters, �AC Convenience Outlets� - $20. ea. Fuse Holder, AC Mains Power Fuse Holder (cap sold separately) - $20. Fuse Cap, AC Mains Power Fuse Cap - $25. Post, Ground post / terminal for phono - $20. Panel / Plate, Rear sheet metal panel, less components - $45. Feet set of 4 - $35. or $18. ea. This is a listing of 'Significant' parts for cross-reference ONLY. 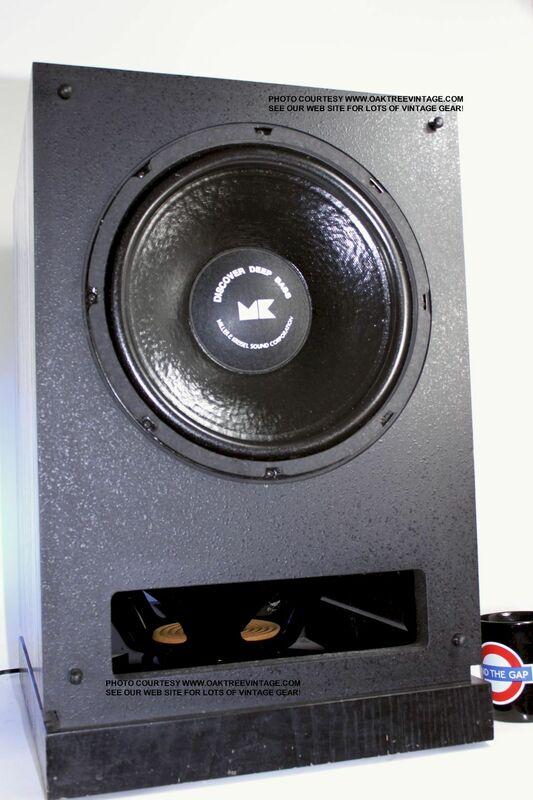 We made notes of these more 'significant' parts while refurbishing a M&K MX-90 subwoofer for re-sale. We do not have this unit available for parts, this information is ONLY for cross-reference. Again these parts are not available from this unit so we do not have them, nor know who might have them. This unit was not parted out and was sold complete. Receiver had excessive DC at speaker outputs. We didn't investigate further as we had 'bigger fish to fry'. Some parts MAY also fit other MCS Stereo Receivers but we have no definitive info. Panel, Face panel with dial glass. Good condition - $55. Pointer, Dial pointer - $20. may or may not be re-movable ??? LED�s / Lamps / Light bulbs, AM, FM, Phono 1, Phono 2, Aux - $12. ea. LED�s / Lamps / Light bulbs, Power or Stereo - $12. ea. Diffusion Panel, Light Diffusion Plexiglass w/ rubber bulb sockets in place - $25. Knobs / Caps / Buttons / Covers, �Volume� knob - $30. Knobs / Caps / Buttons / Covers, �Tuning� knob - $30. Knobs / Caps / Buttons / Covers, Round �Bass�, �Midrange�, �Treble�, �Tone� / �Balance� - $20. ea. Knobs / Caps / Buttons / Covers, Round 'push' caps for � Power�, �Speakers�, �Matrix� & �Headphones� / Push switch caps w/ springs - $15. ea. Knobs / Caps / Buttons / Covers, �Toggle Switch� caps for �Mode�, �Tone Defeat�, �FM Muting�, �Low Filter�, �Scratch Filter� & �Loudness� - $15. ea. Switches / Selectors, 'Power' Push switch PW123-1-1 S-3 TV-3, w/ �clamping capacitor� c .01K,AC125- $30. Switches / Selectors, Push switches on circuit board for �Speakers A�, �B�, �A+B�, �Matrix�, �Headphone� as a complete assembly - $45. Switches / Selectors, �FUNCTION SELECTOR�, �FM�, �AM�, �Phono 1�, �Phono 2�, �AUX� - $35. Switches/ Selectors. Toggle Switches; �Mode�, �Tone Defeat�, �FM Muting�, �Low Filter�, �Scratch Filter� & �Loudness� - $20. ea. Switches/ Selectors. �Tape Monitor� Ratcheting Slide Switch on circuit board 4040502060 - $20. Potentiometer / Control pot, �Volume� Pot 200k Ohms x2 - $35. Potentiometer / Controls, �Bass�, �Mid� & �Treble� pots 100k Ohms x2 - $25. ea. Potentiometer / Controls, 'Balance' pot 250k Ohms x 2 Linear Taper - $30. Flywheel, Dial Shaft / Flywheel / Tuning control assembly (knob sold separately) - $30. Tuning Wheel, Tuning String wheel - $20. Meters, �Signal Strength� or �Tuning� each - $25. Transistors / Outputs, Output Transistors Output Motorola TO3 Transistors 2N3055 or MJ2955 -$25. ea. Circuit Board, Power Amplification / Driver Circuit Board with original Motorola M2N6551, Motorola M2N 6554 driver transistors and Transistors; Motorola LBC557B, Motorola MPS A05 EBCI, Motorola MPS AO5 - $45. Circuit Board, Circuit board #TCIAlS 4044000961 w/ transistors; 2SC900. - $25. Circuit Board, Circuit board #TCI ALS 94 V/ 404060 2050 w/ transistors; 2SC900. - $25. Circuit Boards, Main Tuner Board / TUN 700 TCIJ S94V-0 with IC chips; Motorola ML 1310P 7702L, LBC557B, Hitachi 7H2 HA1137W, Hitachi 7H2 HA1151, Transistors; 2SA844, 2SC460, 2SC461, 2SC535, 2SC945 w/ tuning capacitor - $45. Circuit Boards, Tone, Balance, Equalization circuit board w/ transistors; 2SC900 (potentiometers sold separately) - $35. Circuit Boards, Power Supply Circuit Board 4046000971 w/ rectifier diodes & w/ transistors; 2SC945 (less filter capacitors) - $35. Transformer, Power supply Transformer �4200961378FSLT5M185 (ETP66PU18B) (MAL66A15) - $55. Capacitors, Power supply filter Caps 50V / 6800 uf - $18. ea. Jacks / Terminals / Connectors, �Phono 1�, �Phono 2�, �Aux, �Tape 1�, �Tape 2� entire section as one assembly - $40. Jacks, �Headphone Jack� - $25. ea. Jacks / Terminals / Connectors, Antenna section �FM�, �AM�, �Ground� as one assembly - $20. Fuse Holder, AC mains power / Speaker Protection Fuse holder (cap sold separately) - $20. Fuse Cap, AC mains power / Speaker Protection Fuse Cap - $25. ea. Antenna, �AM Ferrite-Bar Antenna� w/ swivel clamp (repaired crack, but functional) - $25. Panel / Plate, Rear sheet metal panel, less components - $25. Panel, Brushed Aluminum Face plate / panel with dial glass. Good condition - $55. Panel, Inner, Gray, Plastic Face panel with 'green' digital readout filter'. Includes 'Down' & 'Up' tuning 'rocker' button. Good condition - $30. Knobs / Caps / Buttons / Covers, �Volume / Balance� knob set - $35. Knobs / Caps / Buttons / Covers, Round �Bass�, �Midrange�, �Treble�, �Tone�, �Function� - $25. ea. Knobs / Caps / Buttons / Covers, Round 'push' caps for � Power� - $30. Knobs / Caps / Buttons / Covers, Rectangular 'push' caps for � Tuner Presets�, �Memory�, & �Scan / Manual� - $15. ea. Knobs / Caps / Buttons / Covers, Toggle caps / bats for 'Power, �Tape Dubbing�, & �Tape Monitor� - $15. ea. Knobs / Caps / Buttons / Covers, Rectangular, brushed, silver caps / buttons for; 'Speakers', �Tone Defeat�, �FM Muting�, �High Filter�, �Loudness�, & �Mode / FM Muting�, - $20. ea. Switches / Selectors, 'Power' toggle switch 3A/ 250VAC, S-1 TV-3, w/ �clamping capacitor� - $35. Switches / Selectors, Push switches for �Speakers A�, �B�, �A+B�, as a pair on their bracket - $35. 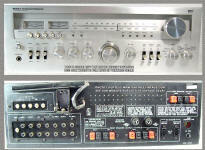 Switches / Selectors, Slide Switch for AM freq selector between 9kHz or 10kHz increments. - $20. Switches/ Selectors. Toggle Switches for �Tape Dubbing� or �Tape Monitor� - $35. ea. Switches/ Selectors. 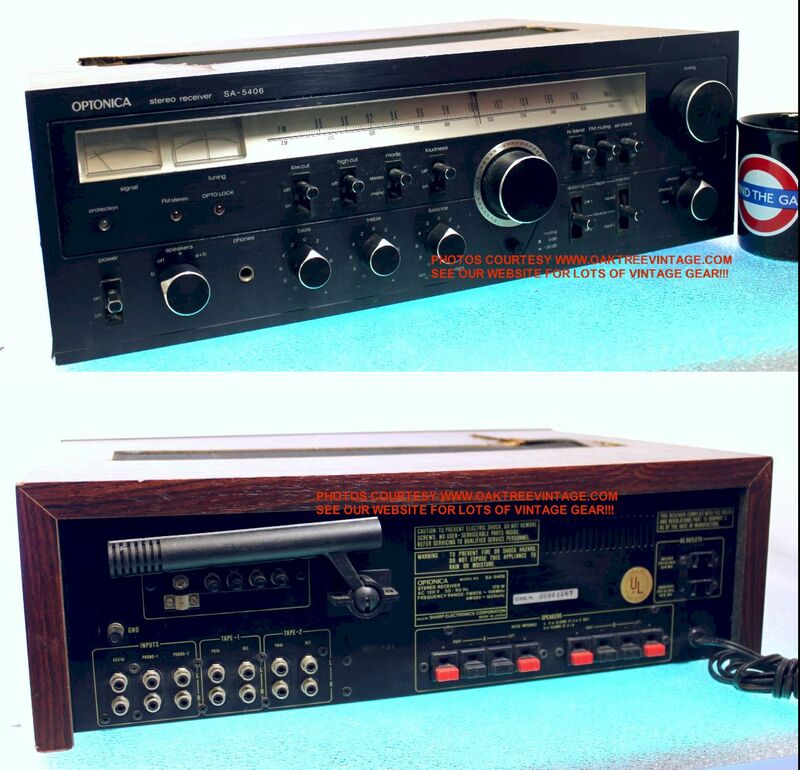 �Function Selector� / 'Input selector', Ratcheting Slide Switch for �AM�, �FM�, �Phono �, & �AUX� - $40. Potentiometer / Controls, �Bass�, �Mid� & �Treble� pots 100k Ohms x2 - $30. ea. Potentiometer / Controls, 'Volume / Balance' 'combo' pot 250k x2 Ohms volume and 250k balance, de-tented - $40. Transistors / Outputs, Output Transistors Output NEC 'Epoxy' Transistors 2SB849 & 2SD1110 - $25. ea. (original Japanese / OEM units. Not cheap, Chinese knock-offs / counter-fits. Tested Good. Heat-Sink, Power amp, Aluminum heat-sink - $35. Circuit Board, Display / Fluorescent tube, NEC FIP7A13A, Tube No. 2F, Readout Circuit board #72914322 W/ IC Chip; NEC EIZ06X-150 / D1703C w/ transistors; 2SA733, 2SC945, 2SK163, and balance of capacitors, diodes, resistors, and devices. - $35. Circuit Boards, Main Tuner / Switch Circuit Board #72914131-1 with IC chips; Hitachi HA11225, NEC C1161C3, Sanyo LA1245, LB1405, 'in-line' packages; M5213L, Transistors; 1SV55, 2SA1175, 2SC535, 2SC945, 2SC1675, 2SC2785, 2SK168, w/ tuning section and balance of capacitors, diodes, resistors, adjustable transformers, pc mounted 'trim pots', and devices (less potentiometers, Switches, jacks, sold separately) . - $45. Circuit Boards, Tone, Balance, Equalization circuit board, 72914122 with 'in-line' packages; NEC UPC1225H, and AN6875 and w/ transistors; 2SC2785, 2SC945 and balance of capacitors, diodes, emitter resistors MPC722 resistors, and devices. (less potentiometers, Switches, jacks, relay sold separately) - $45. Circuit Boards, Power Supply Circuit Board 72914122 w/ 6800uF / 50V 'filter capacitors', bridge rectifier diodes & w/ transistors; 2SB647, 2SD667, and balance of capacitors, diodes, resistors, and devices. - $40. Circuit Boards, Phono Pre-Amp? Circuit Board 72914131-2 w/ 'in-line' packages; M5213L and balance of capacitors, diodes, resistors, and devices. - $35. Circuit Boards, 'LED Power Meter' Circuit Board 72914141-2 w/ LED's. - $25. Circuit Boards, 'LED Signal Strength Meter' Circuit Board 72914131-3 w/ LED's. - $25. Relay, Speaker protection relay TYPE AP2U / 24VDC - $25. Transformer, Power supply Transformer 45006129 / TKP0212-E1 - $45. Jacks, �Headphone Jack� - $25. Jacks / Terminals / Connectors, Antenna section �FM�, �AM�, as one assembly - $25. Feet, Set of 4 feet - $25. Some parts MAY also fit other NAD Stereo Tuners, Pre-amps, Receivers but we have no definitive info. Panel, Front / Face panel, black plastic, decent condition w/ minor edge dings / tics and lower left corner ding (less selector caps / buttons, sold separately) - $45. Knobs / Caps / Buttons / Covers, �Volume� knob #5541537900 - $30. Knobs / Caps / Buttons / Covers, �Balance� knob #5541538000 - $20. Knobs / Caps / Buttons / Covers, �Tuning� button / cap #5541537600?- $20. ea. Knobs / Caps / Buttons / Covers, �Bass�, �Treble� / Control knob #5541537510 - $20. Knobs / Caps / Buttons / Covers, �Tone Defeat� push button switch cap #5541537700 - $15. Knobs / Caps / Buttons / Covers, �Power� push switch cap � green #5541537200 - $25. Knobs / Caps / Buttons / Covers, �Copy� toggle switch cap #5531537800 - $20. Knobs / Caps / Buttons / Covers, �Pre-set�, �Bank� switch cap / push knob with springs, 1-7 #5541537100 - $15. ea. Knobs / Caps / Buttons / Covers, �Enter�, switch cap / push knob, (red) #5541537110 - $15. Knobs / Caps / Buttons / Covers, �Mono�, �AM�, �FM�, �FM Blend�, �Tuning�, �Tape� 1 and 2, � Phono�. �Video�, �CD�, �Low Level�, push button / cap #5541537300 - $15. ea. Display / LED, �EPL�, �FM Stereo�, pair, yellow led on small circuit board - $20. Potentiometer / Control, �Volume� control pot, 042F 20KBX2, stacked with remote control motor (has issue. Half of �split shaft� broken away, but pot and motor still function) - $40. Potentiometer / Control, �Balance� pot 024F20KW - $30. Potentiometer / Control, �Treble� pot 022F V10KBX2 - $25. Switches / Selectors, �Power� push micro switch (less cap, sold separately) - $15. Switches / Selectors, �EPL� push switch (less cap, sold separately) - $25. Switches / Selectors, �Bass EQ� or �Loudness� push switches (less caps, sold separately) - $25. ea. Switches / Selectors, �Tone Defeat� push switch (less cap sold separately) - $25. Switches / Selectors, �Copy�, ALPS Toggle switch on circuit board - $30. Switches / Selectors, �Infrasonic� slide switch - $20. Switches / Selectors, �Search�, push switch (less cap, sold separately - $20. Switches / Selectors, �MM / MC� phono cartridge slide switch- $20. Transformer, Power supply Transformer #5561317020 / 24D043HD TAM - $55. Circuit Board, �Tone Control� / �Power Supply / Rectifier�, circuit board #5553132500 with transistors; 2SA817A, 2SC1959, 2SC1627A, IC NEC PDP636OC, JRC 8240, Relay Takamisawa VS-12MB (12VDC / 10A. 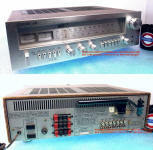 ), Bridge Rectifier W01M/9013 and with balance of capacitors and resistors, (less switches and pots) - $45. Circuit Board, �Remote / Display / Remote Control� circuit board #5553131401 with LED Digital Display / Readout, transistors; 2SA1015, 2SC1815, IC�s: M74HC164B1, NEC D7.507CU, Toshiba TD63001AP, LED�s, push switches. �Enter�, �Mono�, �AM�, �FM�, �FM Blend�. �Tape 1-2�,Phono�, �Video�, �CD�, �Low Level�, �Tuning�, with Push micro switches, ALPS S701-S711 #5054512940, green, clear, yellow, & red LED�s and balance of resistors, capacitors diodes etc. - $65. Circuit Board, �Pre-amp� circuit board #5553132700, with transistors; 2SA1015, 2SA3329, 2SC1815, 2SC3329, 2SC2878, FET 2SK363, voltage regulators 2SB349A, 2SD689A, IC NEC PD6362C, JRC 8240 & 9002B, IC HCF4001BE, In-line package LB1645 and balance of capacitors,0-\ resistors, (less I /O jacks, switches, pots) - $65. Circuit Board, �Tuner� / �Power Supply / Rectifier� circuit board #5553131601, with transistors; 2SA562, 2SA1015, 2SC1815, 2SC1959, FET SK363, 2S930 EOC, Voltage Regulators MC78MOSC, MC78M15C, Horizontal in-line package Toshiba TD6104P, TA7060AP, BA6104, LB1450, IC�s Toshiba TC9147BP, LA1245, LA1235, LA3401, HCF4001BE, Mitsumi tuning circuit and balance of resistors, small transformers and capacitors - $65. Jack / Connector, �Convenience� AC outlet / sockets - $20. ea. Jack / Connector, �ELP�, �Pre-out�, RCA Input / Output, 3 pairs, mounted on small circuit board with balance of capacitors and resistors - $35. Jack / Connector, �Phono�, RCA Gold Input - $30. Jack / Connector / Clip, �Antenna� pair on small circuit board - $20. Jack / Connector, �FM� 75 Ohm antenna input fitting - $15. Panel, Rear sheet metal panel (less any input / output jacks / components) - $25. Face panel with glass (less knobs / buttons) Decent condition. Black anodized aluminum. - $65. Dial Slide Rule panel, Silk-Screened dial panel, Brushed aluminum - $35. Knobs-Buttons-Caps, Tuning knob, Black Anodized, Milled aluminum - $35. Knobs-Buttons-Caps, 'Volume' knob Black Anodized, Milled aluminum - $35. SOLD / MIA? Knobs-Buttons-Caps, 'Selector' for Speakers or Input Selector knob Black Anodized, Milled aluminum - $30. ea. Knobs / Caps / Buttons / Covers, �Balance�, �Bass�, �Treble�, round knobs Black Anodized, Milled aluminum - $35. ea. Caps / Buttons, �Toggle Switch� button / cap / bat for 'Power', 'Low Cut', 'High Cut', 'Mode', 'Loudness', 'Hi-Blend', 'FM Muting', 'Air Check', 'Dubbing', 'Tape Monitor' Black Anodized, Milled aluminum - $20. ea. LED, 'Protection' LED on circuit board - $20. LED, 'FM Stereo' LED on circuit board - $20. LED, 'Optilock' LED on circuit board - $20. Indicator / Pointer, Dial pointer / indicator / needle - $20. Meters, D'Arsonval / Analog 'Tuning', #41517 - $35. Meters, D'Arsonval / Analog 'Signal Strength', #41518 - $35. Diffusion Bar, Dial Light Plexi-glass 'diffusion' bar (lamp sockets / bulbs no included) - $30. Lamp / Bulb Sockets, Dial diffuser rubber bulb sockets (used in numerous units, including maybe Pioneer) - $15. ea. Switches / Selectors, �Tape Monitor� SW203 'Toggle' switch (caps sold separately - $35. Switches / Selectors, �Tape Dubbing� SW202 'Toggle' switch (caps sold separately - $35. Switches / Selectors, Toggle Switches; 'Low Cut', 'High Cut', 'Mode', 'Loudness', 'Hi-Blend', 'FM Muting', 'Air Check' (caps sold separately) - $30. ea. Switches / Selectors, Input / Function 'Wafer' Switch, 'AM', 'FM�, 'PHONO-1', 'PHONO-2', & 'AUX' (knob sold separately) - $55. Switches / Selectors, 'Speaker Wafer Switch', 4631920 - $35. Switch, Toggle Power Switch Noble - $30. Switch, Push 'Audio Muting' switch - $30. SOLD / MIA? Control Potentiometer / Control, Volume Control Pot - $40. SOLD / MIA? Control Potentiometer / Control, �Bass�, Treble�, control pots, Noble - $35. ea. Control Potentiometer / Control, Balance Noble - $35. Transformer, Power supply Transformer TKK P0608AF / TKP0179-6 - $65. Relay, Fujitsu FRL-264 - $25. Circuit Boards / Cards, Power Supply Circuit Board Sharp H13A 94V-1 / F0758AF (less Filter Caps, but with balance of components including rectifier diodes, capacitors, resistors etc.) - $35. Circuit Board, �Main power amp / Speaker protection� circuit board assembly, F0901AF with IC Chips: Hitachi HA1457, HA12002, (less output devices, heat sink, user controlled potentiometers / controls, switches / selectors, relays, 'STK Voltage Amplifier STK3082) but with balance of transistors, resistors, capacitors, diodes, voltage regulators, connectors, and PC mounted pots / variable resistors - $85. Circuit Board, �Tuner PCB�, circuit board Sharp H13A 94V-1, w/ 6-gang tuning capacitor #RCV-C0058AFZZ with transistors: 2SA872, 2SC458, 2SC460, 2SC535, 2SK117, IC's; Hitachi HA1137W, HA1151, HA1196, and balance of other transistors, capacitors, diodes, PC mounted 'variable resistors', adjustable transformers, tuning capacitor, connectors and resistors (less toggle and wafer switches) - $65. Jacks / Terminals / Connectors, 'Phono-1' / 'Phono-2' RCA Input jacks / connectors all mounted on circuit board - $35. Jacks / Terminals / Connectors, 'Tape-1' RCA I/O jacks / connectors all mounted on circuit board - $35. Jacks / Terminals / Connectors, 'Tape-2' RCA I/O jacks / connectors all mounted on circuit board - $35. Jacks / Terminals / Connectors, 'AUX' RCA input jacks / connectors - $25. Jacks / Terminals / Connectors, �Head Phones� - $25. Antenna, Antenna �terminal� post strip with binding posts - $30. Feet, Set of 4 Feet - $25. set. 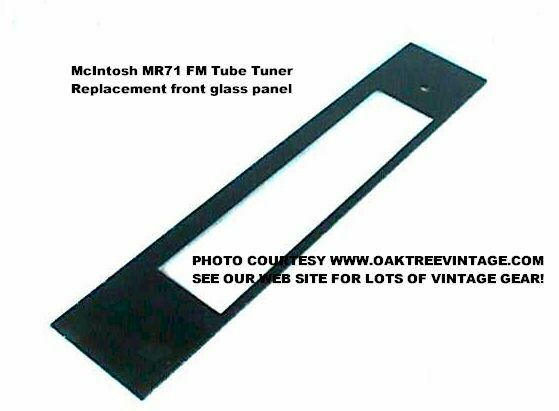 We have new, re-production front panel glass plates for the MR71 MR 71 tuner. These are no longer available from McIntosh. They are cut to the original size and finished using black enamel (more durable than the original bubbling ink that was used). Looks GREAT! 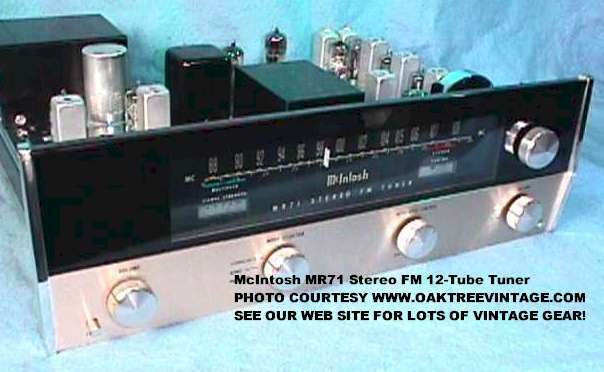 Sorry we don't have the dial glass with the Silk-screened "McIntosh - MR71 STEREO FM TUNER" and the station numbers. Relay, DEG Relay OSA-SH-212DM3 12VDC / 5A 50VAC / 3A 125VAC / 30VDC - $20. ea. Capacitors, Filter Capacitors, Rubicon 80V / 5600uF / mF - $15. ea. Circuit board, #AFT-33 / 241A145 featuring tuning capacitor, AM 'Stick' antenna, transistors; 2SA826, 2SC461, 2SC710, 2SC1740, 2SD360, K55, K68A, and IC chips; Hitachi HA1197, 4400, 4420B, and balance of mounted components (less switches & pots) - $45.